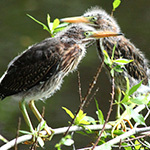 With more than 220 species of birds, Kiawah is a birder’s paradise. Travel with our birding experts to several remote locations to explore various island habitats and discover the natural history of our diverse avian wildlife. Requirements: Participants must be at least 16 years old. What to bring: Comfortable walking shoes, camera and drinking water during hotter months. Schedule: This program is offered throughout the year. Schedule of Activities. For reservations, please call or visit the Heron Park Nature Center at (843) 768-6001. From one of our naturalist, Juliana: This morning’s Back Island Birding tour witnessed Bald Eagles in the throes of mating flight displays. Two pairs of Bald Eagles were seen flying closely in their individual pairs, sometimes seeming as though they would run into each other. Suddenly, a pair locked talons and began to free fall, wings flapping wildly as the eagles tumbled through the air! This lasted for only a few breathless moments, but all who witnessed were awed by the trust eagles have in their life-long mates. This experience alone was well worth the shivering and chill we endured in today’s freezing morning temperatures. Other highlights of the morning: Wood Storks amidst a flock of juvenile White Ibis, a juvenile Red-shouldered Hawk dodging the advances of Blue Jays, and an undulating Anhinga snaking through the chilly waters looking for breakfast.